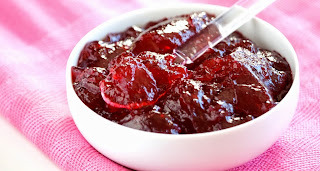 Cranberry Apple Cider Jelly is very tasty. The apple cider adds a little pizzazz to a traditionally easy recipe. Remove bad berries and wash with cold water. Place the berries in a medium sauce pan and add apple cider. Bring to a boil and simmer until the cranberries burst. Add sugar and cook 8-10 minutes. Pour into a small bowl or jar.